FlexSense, offers our UltraPure formulation - giving you a nitrile glove that is completely free of accelerators (chemicals) most commonly used in the manufacture of nitrile exam gloves that can cause Type IV allergies. FlexSense also offers tactile sensitivity that is unsurpassed. FlexSense offers two other unique clinical advantages: EaseOn interior coating for easy glove donning & EaseOff exterior surface that most tapes and adhesives will not stick to! 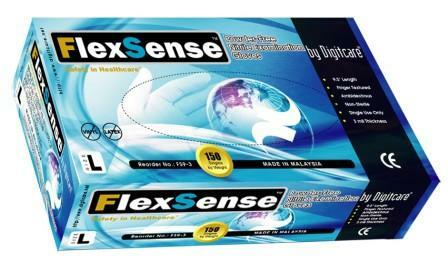 FlexSense is great for hospitals and convalescent homes.